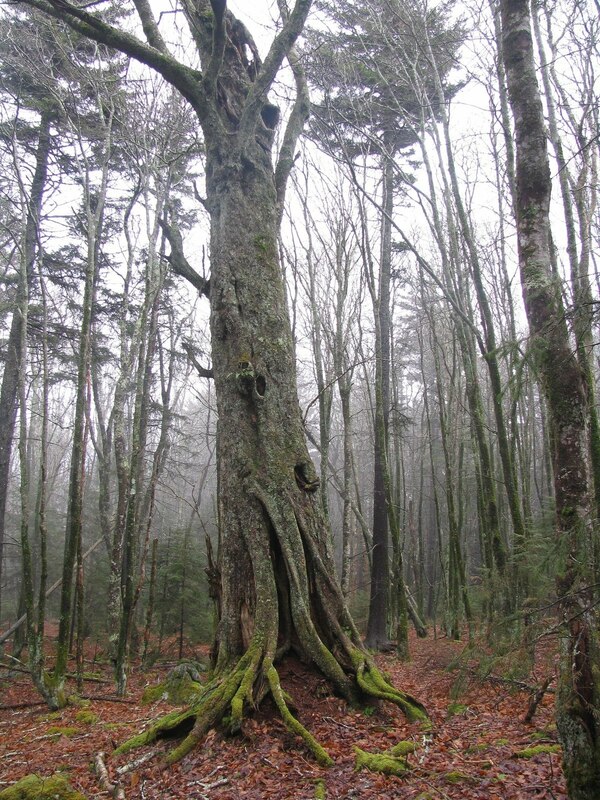 The Pine Mountain Trail in Mount Rogers National Recreation Area used to be the route of the Appalachian Trail. Now the AT meanders four times the distance in a huge loop that, on paper, looks like a deliberate attempt to prolong the thru-hiker's agony. There's so much intensely interesting experience on this round-about route, that to avoid it for the sake of making time is the highest form of trail blasphemy! and from the wind-stunted trees in the alpine meadows - this one near The Scales. But then there's the chicane at Wilburn Ridge. You think the trail is leading you over the 5400 foot rocky summit, but instead, it takes you through a damp, dark cavern under the rocks. 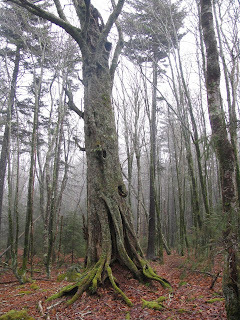 Look at this photo - the white blaze on the tree is the invitation into the folds of darkness. It's called 'Fatman Squeeze', not to be confused with the more famous 'Fat Man Squeeze' near Chattanooga, TN. This one has much more character. The traverse under dripping boulders is little more than 50 feet, but the experience will last a lifetime. Then there is the wildlife. 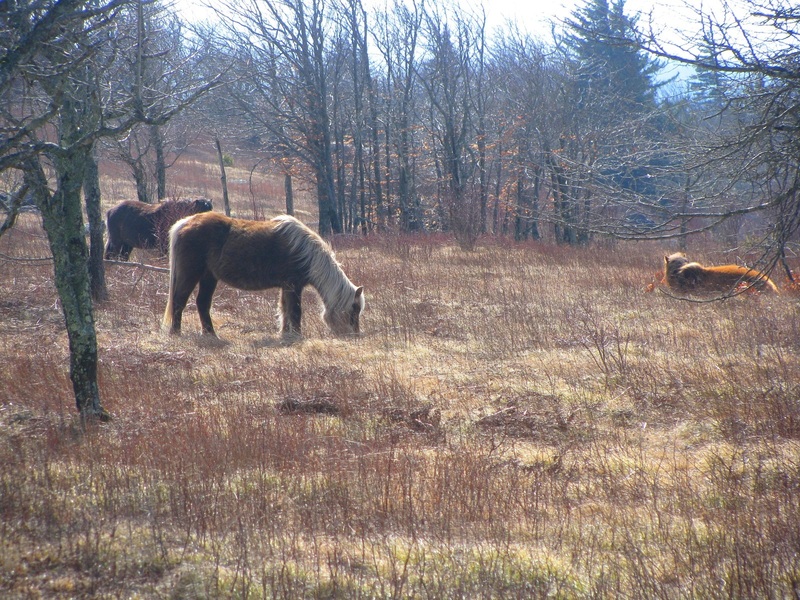 Decades ago the forest service introduced winter-hardy ponies to this landscape in order to help maintain its open character. 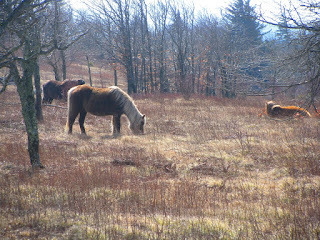 They roam the millions of acres of open and semi-open land year-around. Once a year, like the Chincoteague ponies on the coastal barrier islands, they are rounded up, given a health check, and a few are auctioned off to keep the population stable. The only people I met on the trail today were a day-hiking couple who were hoping to catch a glimpse of these specimens. That was six miles from where I saw them. The tacit lesson: you have to put in the miles to get the rewards. Hike the long way, don't take the short cut. Stay on the trail from dawn to dusk, and your senses will be rewarded, nay OVERLOADED, with the sights, smells, sounds, tastes and feel of the trail. What a glorious day!